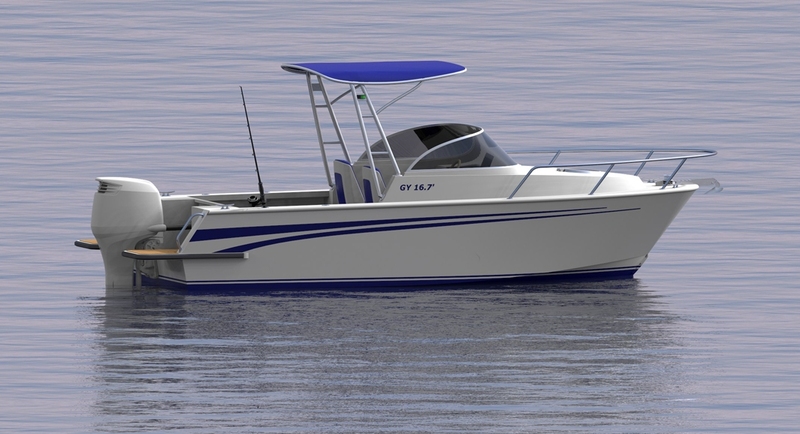 This is a new design for 5.0m family day boat. While developing this design we were thinking for a boat that every one family member can enjoy and be safety on board. She is a smaller version of the very successful design of the 6.25m fishing boat, launched in May 2013. This boat proved to be very fast, enjoyable to drive and seaworthy. The owner, one of the most experienced boat builders in New Zealand described her as the best boat he has ever been on. The boat, including its scantlings, cockpit floor height, down flooding height and angles, cockpit drainage and stability requirements, is designed to comply with European RCD requirements and can be classified for CE approval category C.
- All of the aluminium plates, structure parts and extrusions to build the hull, the deck, the cabin and the interior. - Full set of printed structure drawings, set up drawings and folding lines, welds, tables of offsets, etc. To facilitate and speed up the building process, the bottom structure and the MDF jig framing are interlocked. to contact us, so we can discuss the project in more details. - Deadrise at transom 19 deg.